This is the second in a series of 3 articles about the technologies used to broadcast theatre audio description. The first was about infrared and the third will be about WiFi. While infrared used to be listed under conferencing equipment, radio equipment is usually listed under ‘tour guide system’ (think large groups of tourists in museums). So, once again, these systems were not originally designed for our purpose, and while they don’t offer a perfect solution, they can be very effective. So, if infrared has been ubiquitous and works – why consider radio? Mainly because it is not a line of sight system, so you don’t get ‘dead spots’ in the same way, but also because one transmitter will probably cover the entire auditorium. In fact, one transmitter will often cover the majority of a venue, so that customers can listen to the introductory notes from the bar – rather than having to take their seats before everyone else. As a provider of audio description radio works really well for VocalEyes. If we’re working at a venue that has no broadcast capability, years ago we would have had to take our own modulator, a minimum of two infrared radiators that we would have to very quickly fix in very specific positions – and a lot of cable. With radio, we can cut this down to just a mains-powered transmitter similar in size to a set-top digital box. From the description position this may cover the whole auditorium, and if not we can use our XLR3 input cable to position it nearer to the auditorium or we can use an RG59B/U cable to get an aerial into or nearer to the auditorium. Synexis A system from German company Beyer Dynamic, which we were really interested in, but during our trials they were still bringing the product to market and their demonstration transmitter was significantly less powerful than the final model was set to be – and it flunked our theatre trial. The final product may now be worthy of consideration. Sennheiser 1039 As with infrared, one of the big players is that other German company – Sennheiser. Their 1039 system is excellent and worth considering as it offers strong and reliable transmission of high quality audio. However, if you actually attach the belt-pack receiver to your belt and sit down in a theatre seat, the antennae will stab you in the stomach and as you move around, the contact with the antennae can cause interference. When we conducted these investigations, we found one radio system that was (for our purposes) significantly better than the others. Sennheiser’s Tourguide 2020-D system , so, much of the rest of the article and service user comments will focus on this. The 2020D also has a hand-held radio microphone, but we have not used this. The system has a maximum range of 100 metres; the bodypack transmitter may reach that across clear air, but in most environments 50 metres is a safer maximum. The mains-powered transmitter offers a range closer to 100 metres in more environments and gives a higher potential volume. There are 6 different channels (UK version) and the ‘digital’ element is that it checks the signal it receives, and if it is significantly different, it disregards it, making it relatively impervious to interference. There is the tiniest of delays between broadcast and reception by the user – but it is not noticeable. With audio description, speech is intermittent (between the show’s dialogue) and the mains (but not the body-pack) transmitter has an audio gate to stop background noise being broadcast when there is no speech. Occasionally this has meant the loss of the first syllable. Our main use of radio at a dedicated theatre venue has been at Shakespeare’s Globe. This was inevitable as infrared does not work outdoors in the daytime, and we began working there before delivering audio description over WiFi was a twinkle in anyone’s eye. The Globe also has some specific challenges, for one, we could not have any post-seventeenth-century technology visible. Metal can absorb and reflect radio waves as can thick sections of non-conductive materials. In a largely wooden building you would expect radio transmission and reception to be excellent… but either someone secretly used some wire mesh amongst the wattle and daub, or the historically accurate nine-inch nails are the issue – in any case you cannot successfully broadcast from within our description position at Shakespeare’s Globe. But you can cable out a small snub aerial and dangle it above the stage and get excellent coverage, without it ever being noticed. But it took a fair bit of trial and error to figure this out, proving it is important to try before you buy and dangerous to make assumptions. When we first started using 2020D at the globe the sound was so clean we received a customer complaint. The audience member was used to having a constant low hiss from infrared and older radio systems and found this comforting, the absolute silence between the describer speaking was unnerving to them – was it still working? 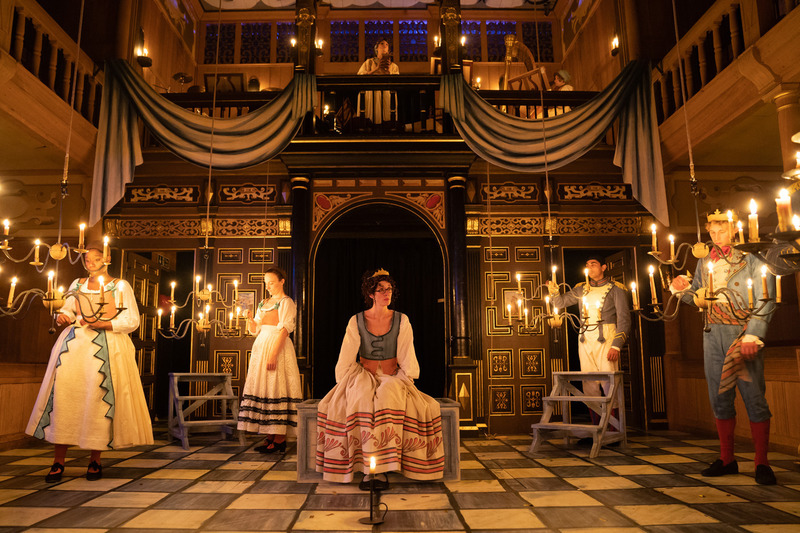 We had been hiring Sennheiser’s 2020D system for work at Shakespeare’s Globe, and when they opened the Sam Wanamaker Playhouse, they bought their own 2020D system. Only one radio transmitter was needed for both Globe and Playhouse, as it was easily transportable between them. We have a general rule that we do not broadcast a mix of audio description and show sound. On occasion we have broken this rule at Shakespeare’s Globe because being open air; the weather, a passing boat or a helicopter can occasionally make it difficult to hear the actors. Including show relay is relatively safe to do at the Globe because there is no amplified sound that could drown out the audio description. On one occasion when a customer needed to have some minor first aid during a show, they were able (because of the radio system) to continue following the show aurally with description until they returned to the auditorium! For several years we had no interference issues at Shakespeare’s Globe, and when we did the self-checking meant that no one heard it. You either have excellent reception, or you hear nothing. With audio description, unless you’re listening via a receiver with the audio describer in front of you, you don’t always know when the describer is speaking and therefore if you’re missing anything due to interference. An intermittent interference issue can therefore be difficult to trouble shoot. However, the team at Tourguide Systems helped us to figure out that it was due to mobile phones using 4G. We subsequently stopped using channel 1 (our old default) and switched to the system’s channel 6 which is furthest away from 4G, and we have not had an issue since. Incidentally, the charging case has a button that enables you to quickly set the channel on every receiver. 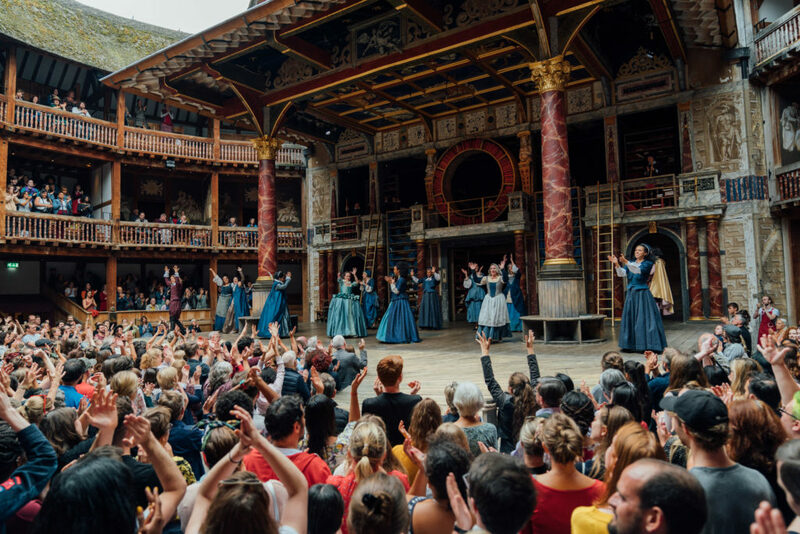 Following Shakespeare’s Globe’s purchase of the system from Tourguide Systems, VocalEyes bought one as well – and ours is regularly used for outdoor performances at Regent’s Park Open Air Theatre; Liberty, Unlimited and Greenwich and Docklands International Festivals as well as having been deployed at Hull 2017, Milton Keynes’ IF and 50th anniversary Festivals – as well as indoors at venues with no infrared system or one that is failing. VocalEyes and Shakespeare’s Globe are now able to support each other by lending additional receivers to each other as needed. We regularly work in a west end venue fitted with infrared, where the rake of the stalls is so slight it makes infrared reception difficult. The venue technicians kindly raise the infrared radiators higher up on the proscenium arch for the audio described performances to improve the angle for reception (they unfortunately cannot be sited there permanently), but the show attracts many children – and being shorter than adult audience members, the line of sight infrared reception is poor. We now take our 2020D mains transmitter and broadcast both infrared and radio – giving the radio receivers to children using the service. With no perfect way of broadcasting audio description, it is becoming increasingly popular for venues to use two systems, thereby minimising the negative issues of any one system. Because radio is not line of sight, receivers do not have to be held up high in order to ‘see’ the transmitter. This means that most systems offer a small box receiver with a standard socket so an infinite variety of headphones (or an induction neck loop) – potentially the customer’s own – can be used with them. The receiver can be clipped to a belt or clothing, worn on a lanyard…left on people’s laps…potentially even put in a pocket. It therefore does not gradually weigh the customer’s ears down during the show like a stethoset! But, as a venue – do you allow customers to use their own headphones, or can you even stop them? We have all been on public transport with that person with the volume really high and headphones that bleed sound really badly…not such an issue if you are using a radio system to broadcast show sound for hard of hearing customers, but with audio description this could be a distraction to other patrons, and they may take it up directly with the patron using the audio description. If you supply the headphones…what style, how much can you spend as they are breakable/losable, how do you keep them hygienic for use and what length should the cable be to allow movement but stop customers from getting tangled during the show or tripping on the way to their seat? How do you store them so they don’t get tangled/damaged and so they are quick to hand out and put away? Some thoughts on these questions: Some ear-bud style earphones have rubber covers that can be cleaned and replaced (as with stethosets) but you have to be prepared as a venue to do this and Customers may be dubious about your levels of hygiene. 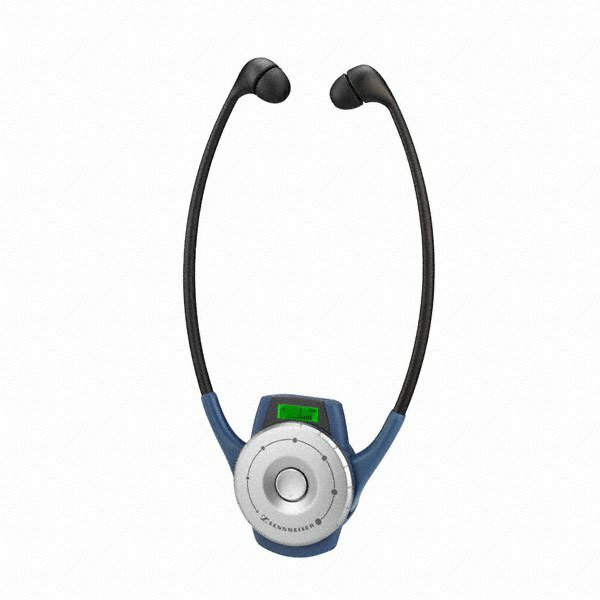 As we heard in the previous infrared article – over-ear headphones, while good for stopping noise bleed, can leave customer’s feeling cut off from the live event (and with sweaty ears). One option is 1980s-style foam on-ear headphones. Noise bleed is often minimal (but this varies massively between models). A metre of cable is probably about right. Short lengths of dowel fixed to the wall in the cloakroom (or wherever you keep/hand out receivers from) can be used to store headphones so their cables can be kept untangled. One of the many positives about the 2020D system is that in addition to the belt-pack receiver, a stethoset model is also available. Stethosets have drawbacks as previously discussed, but they are one piece and familiar to AD audiences due to their use with infrared systems. In general – having options to offer is better than not. As with the infrared equipment, these receivers have not been designed specifically for use by people who are blind or partially sighted. Like the newer Sennheiser infrared stethoset receivers, the radio version switches on when the arms are pulled apart for placing the earbuds in your ears, and they switch off shortly after taking them off and allowing the arms to close back in. Straightforward, but users have noted that the combination of this and the volume control being a wheel with no start or end point – makes them feel that they are not really in control of the receiver. The button for changing the channel is in the middle of the volume wheel, and there have been occasional reports of people accidentally changing channels mid-show. The channel is indicated visually on a small screen. Potentially a customer could circle through the available 6 channels for a long time before they hit on the channel being used for the audio description – because the describer is probably not speaking constantly. There is a way to lock receivers to a specific channel, however it requires a special interface with a computer, making it difficult to do quickly if your sound check indicates you need to switch channel due to interference. The belt-pack receiver is essentially the same as the stethoset – but with a small on/off button replacing the action of the arms. Service user Kasia Kubaszek finds using Sennheiser’s WiFi system Connect the most comfortable to use, but ultimately agrees with Gary, rating radio’s 2020D system as the best overall because ‘it seems to be the most reliable form of AD.’ She rates its reliability as 4.5 out of 5, as compared to infrared’s 3.5 and WiFi’s 3 out of 5. Radio has been underused for audio description and is worth consideration by venues looking to start offering audio description or to replace aging infrared. But there is a wide choice, so some research and trialling is needed. No system is perfect, however Sennheiser’s 2020D offers good sound quality, reliability and a choice of both receivers and transmitters makes it very adaptable. Not line of sight! While the stethoset receivers for infrared ensure that the receiver is relatively high up and ‘seen’ by the radiators, radio receivers can be small packs with standard headphone sockets: enabling a variety of headphones can be used. Generally, one transmitter can cover an entire auditorium: making installation and maintenance much easier. Stethosets, similar to the infrared system, are also available and controls of all receivers are still tactile. Adaptability: Mains-powered stationary transmitters provide wide coverage for a venue, while pocket-sized, battery-operated transmitters offer convenience for temporary setups at indoor and outdoor events. Rental kits for AD are readily available (as the set-up is easier and not so permanent as infrared), so you can try-before-you-buy and/or hire-in additional receivers or transmitters for special events. There are no two-channel radio transmitter systems. To broadcast both the AD and the relay of the show you need to have two transmitters. To offer show relay, audio description and a combined show relay and audio description channel (matching the offer of a single infrared system), you need three transmitters, and a sound mixer to put show relay and audio description into the third transmitter. However, using an appropriate antenna-combiner means you only need one antenna, and dual use of audio description and show relay by customers is perhaps not as prevalent as imagined. Real and imagined concerns about interference with other radio systems: either that the AD radio system will suffer from interference and/or that it will interfere with radio systems used in the show or front of house. However, tourguide systems (e.g. 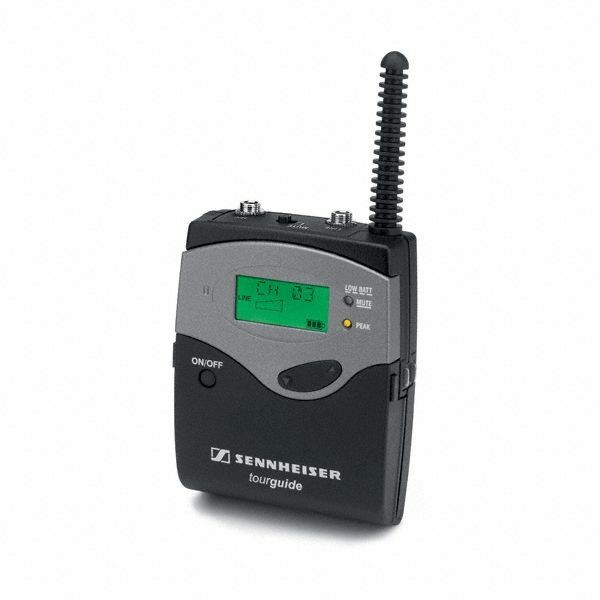 Sennheiser 2020) typically operate on the licence-free radio-microphone channel 70 band (863-865MHz), that is no longer used by professional sound systems in venues. The Sennheiser 2020 system also uses its own digital transmission technology, so the receivers will only receive their set channel, with no risk of interference-noise, fuzzy audio or hiss spoiling the AD. Tourguide systems vary greatly in price and performance; in terms of radio coverage, audio quality and background noise, so not all are satisfactory for AD. Receivers can be less familiar to audiences and therefore require a little more support from front of house. Multiplicity of headphone options can cause complications: length of cable to get tangled; cleaning of ear-buds/headphones; whether or not customers bring their own; lack of control over sound-bleed to other customers. Because radio is not currently widely used and because of the multiplicity of options, if you suddenly need to borrow more receivers, neighbouring theatres are less likely to have a compatible system. This is the second of three articles, written by the VocalEyes Theatre Programme Manager Michael Kenyon. Add a comment below if you any questions, or contact Michael (michael@vocaleyes.co.uk) directly if you have any enquiries about theatre audio description.